Two athletes ran neck and neck down the final stretch of the 3.1-mile road race, leading a field of 89. At the finish line, Lowndes High freshman Chance Roe eked out a 17:42 to 17:43 win over Valdosta State University freshman Nathinael Wondimu. It was Valdosta's inaugural Titletown 5K on Saturday morning, 27 April 2013. A good 200 meters behind Roe and Wondimu, Ryan Winkel, a teammate of Wondimu on the VSU cross-country team, finished third in 18:27. Another VSU Blazer, Carlos Ponce, was fourth in 18:33. Matthew Baun of St. John Catholic School was fifth in 19:08, and Valdosta High School's Milo Mirate was sixth at 21:19. Eighth place went to the fastest master in the race, Michael Baun of Valdosta, who ran 21:19. Preceding the elder Baun across the finish line was ten-year-old Kelsey Morse, the top female in the 2013 Titletown 5K. Placing seventh overall in 21:27, Morse led a sweep of the first three female spots in the race by members of Valdosta's Viking Runners Club. Eryn Wilkely (9th, 22:24) of the Vikings was the second female finisher, and the Vikings' Mackenzie Morse (11th, 22:36) was the third. After the Viking assault on the finish line, Valdosta's Alice Smoot came in 15th overall in 22:55, the fourth female finisher and first master woman. Proceeds of the Titletown Track Club 5K went to benefit the cross-country programs of Valdosta Middle School. Valdosta MS cross-country coach Ryan Kelly directed the race. Thomasville, Georgia was founded in 1826. It's hard to believe, but the Rose City Run didn't come along till much later. The 10K road race is part of Thomasville's Rose Festival, which only dates back to the 1920s. The run wasn't added to the festival until 1978. So the latest edition of the Rose City Run, on Saturday morning, 27 April 2013, was the 36th annual. "I'm going to say, 'on your marks, get set, go.' The mayor is going to fire the gun. If the gun don't fire, you go anyway." The gun may or may not have fired, but the runners did go. Vince Molosky was fastest off the line leading the field along Broad Street and around the turn onto Smith Avenue. By the time Molosky reached the end of the first mile, though, three runners had closed with him--Chris Lake, Will Stanford, and Zac Buchholz. Buchholz, a graduating senior at Tallahassee's Leon High School, fell back early in the second mile, leaving the race to the other three athletes. Chris Lake had won the last three Rose City Runs, but this year he was racing just 12 days after finishing the Boston Marathon. Vince Molosky was coming off an even longer run; two weeks earlier he had raced 50K in Torreya State Park, 31 miles over trails. Will Stanford had the opposite problem. He hadn't raced much since graduating from Leon High School in 2011. Rose City was only his third race of 2013. Nevertheless, near the end of the second mile it was Will Stanford who grabbed the lead going up the hill near Cherokee Lake. He was still out front turning onto Pinetree Boulevard. Molosky dropped back. Chris Lake chased Stanford as best he could. "I was eight seconds behind Will at four miles," recalled Lake. "But he just got away from me on the hills on Clay Street." Stanford certainly did get away, stretching his margin to more than a minute over the last two miles. He was alone on Broad Street when he crossed the finish line with the win in 32:52. Lake was runner-up in 33:57, with Molosky third in 34:23. Zac Buchholz hung on to finish fourth in 35:07. David Knauf was the first master runner, finishing eighth overall in 36:59. Tallahassee lawyer Sheryl Rosen successfully defended her Rose City women's title, leading wire to wire and posting her second-best 10K time ever of 37:08, finishing ninth overall. Renee Cox held the second position in the women's competition during the early miles, but she was overtaken by Thomasville master runner Mary Anne Grayson and by Vicky Droze. Grayson was the second female finisher, placing 25th overall in 41:49. Droze was third across for the women in 42:47, with Cox fourth in 43:05. 409 athletes finished the 2013 Rose City Run 10K. Almost certainly, the Rose City Run will be back for the 37th time on 26 April 2014. Because a Thomasville without its Rose City Run is as hard to imagine as Thomasville without the Big Oak. 2012 story, "Lake and Rosen collect more Rose City titles"
2011 story, "Lake and Garcia go for two at Rose City"
2010 story, "Lake and Hines beat the storm at Rose City"
Some said there were a thousand runners, others said it was closer to 1,500. What was certain, though, was that there were many hundreds on the streets of Tallahassee's Southwood community. There were more athletes than those streets would ever see outside of Thanksgiving Day and the annual Tallahassee Turkey Trot. They were there on Sunday afternoon, 21 April 2013, to show their solidarity with the victims of the Boston bombings of April 15, the runners of the Boston Marathon, the people of Boston, and the citizens of the United States. They were there to run 5.2 miles. It was an odd distance. When the bombs went off in Boston, Massachusetts near the finish line of the Boston Marathon on Boylston Street, the area became a crime scene. Additionally, no one knew that there weren't more bombs in the area. So even though there were still runners on the course, the finish line was shut down. No one was allowed to enter the area. More than 17,000 runners had finished the 117th annual race, but over 5,000 were stopped short of the finish line. Many were halted at the 21-mile mark--5.2 miles from their goal. Back in Tallahassee on the evening following the marathon, Shannon Colavecchio of Badass Fitness thought that one way that local athletes could express their feelings about the bombings was to do a 5.2-mile run--the distance from the finish line that so many marathoners had been forced to end their run. Without much experience in producing a running event, Colavecchio and her friends decided to go ahead with the idea. No more than a few dozen friends and acquaintances were going to show up, right? They picked a course, decided that the run would be at 5:00 PM on Sunday, and posted the event on Facebook. 5.2 miles at 5:00 PM; 5.2 at 5 for Boston. Almost immediately, hundreds of people RSVPed their event on Facebook. To put that in frightening perspective, fewer than 500 sent RSVPed the aforementioned Turkey Trot on Facebook in 2012, an event that was attended by 6,000 participants. Clearly people liked the idea. Just as clearly, the run was going to be too big for the parking and streets around Badass Fitness. The run was moved to Southwood. The local running community including some members of Gulf Winds Track Club rallied around Badass Fitness's leadership, and somehow the event happened. Not quite six days after Colavecchio came up with the idea, over a thousand were gathering on Esplanade Way to run 5.2 at 5 for Boston. Albert Reed took the lead at the two-mile mark and never relinquished it, going on to win the 5.2-mile Run for Boston in 31:56. Florida State University women's track coach Karen Harvey was the first female finisher, placing fourth overall in 32:27. There were certainly folks running fast at Southwood, and there were people out there who were racing. That wasn't important, though. Sure, Karen Harvey was the first woman finisher. But it was more telling that she was out at Southwood only minutes after getting off a flight at Tallahassee Regional Airport. Everyone at Southwood was out there because they needed to express how they felt about Boston. Back in New England, Neil Diamond and James Taylor had the same need. They're singers, so they sang. The people at Southwood were runners, so they ran. After a little over an hour the runners cleared the streets of Southwood. The event raised around $15,000 for the Boston Red Cross and One Fund Boston. Shannon Colavecchio, "To Boston, from Tallahassee, With Love"
36th annual Rose City Run 10K and one-mile kids' run. 8:00 am ET 10K / 9:30 am ET one mile. North Broad Street and Monroe Street, Thomasville, GA. USATF certified course GA92011WN (10K). 2012 story. 2011 story. 2010 story. Event web site. Event page on Facebook. Entry form. 2013 Rose City Run tabloid. rcr@ymcathomasville.org or 229-226-9878. 2nd annual Ronald McDonald House Red Shoe Run 10K, 5K, and one-mile fun run. 8:00am ET one mile/8:30am ET 10K and 5K. Southwood Capital Office Complex, Esplanade Way, Tallahassee, Florida. 2012 story. Kathy Anderson, kanderson@rmhctallahassee.org or 850-222-0056x23. 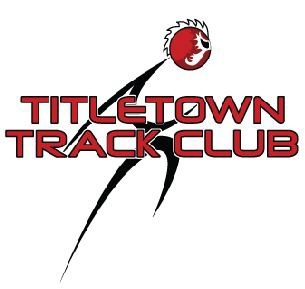 Titletown Track Club 5K. 8:00 AM ET. Valdosta Middle School, 110 Burton Avenue, Valdosta, Georgia 31602. Event page on Facebook. Entry form and flyer. Online registration at RunSignUp.com. Ryan Kelly, rkelly@gocats.org or 229-333-8555. Superhero 5K Trail Run and one-mile fun run. 8:00 AM CT 5K / 9:00 AM CT one mile. Westgate Park Tennis Center, 801 Recreation Road, Dothan, Alabama 36303. Entry form and flyer. Pam Miles , 334-671-1966. Doggie Dash 5K and one mile fun run. 9:00 AM ET. Willie J Williams Middle School Stadium parking lot, 904 4th Street SE, Moultrie, Georgia.Online registration at active.com. 2nd Annual Race for Enrichment 5K. 8:00 AM ET. Bethlehem Community Center, 712 SW Bethlehem Avenue, Fort White, Florida. Online registration at active.com. Food Dash 5K. 9:00 AM ET. Sandels Building, 120 Convocation Way, Tallahassee, Florida 32303. Event web page. Event page on Facebook. Race flyer. Rachel Mohler, rmohler@fightinghunger.org or 772-643-3670. 26th annual Gnat Days 5K. 7:00 PM ET. Courthouse Square, Camilla, Georgia. 2012 story. 2011 story. Entry form and flyer. Jennifer Burnum, jennifer@camillageorgia.com or 229-336-5255. 12th annual Tallahassee Tails and Trails 10K, 5K, and one-mile fun run. 8:30 AM ET. Tallahassee-Leon County Animal Service Center, 1125 Easterwood Drive, Tallahassee, Florida 32311. 2012 story. 2011 story. 2010 story. 2009 story. Event web site. Event page on Facebook. Entry form and flyer. 28th annual Bay County Race Judicata 5K. 8:00 AM CT. Bay County Courthouse, 300 E. 4th Street, Panama City, Florida. Online registration at active.com. Dothan Fire Department “Fit to Fight” 10K / 5K. 8:00 AM CT. Dothan Fire Department Station #1, 600 Columbia Highway, Dothan, AL 36301. Entry form and flyer. Chief Shan Ash, snash@dothan.org or 334-615-4555. F.A.M. Festival 5K Run For Haven Hospice. 9:00 AM ET. 778 NE Lake DeSoto Circle, Lake City, Florida. Online registration at active.com. Stephanie Brod 352-271-4665. University Academy Run the Runway 5K and one-mile fun run. 8:00 AM CT. Old Panama City Airport, 1415 Airport Road, Panama City, Florida. Online registration at active.com. Hornet Hustle 5K. 8:30 AM ET. Brewer Lake Youth Center, Day, Florida. Event page on Facebook. Matt Swain, 209-0241. Marzuq Shrine's 10th annual Mothers Day 5K. 8:00 am ET. Maclay Gardens State Park, 3540 Thomasville Road, Tallahassee, Florida 32309. 2012 story. 2011 story. 2010 story. Keiff Lindsey, romanroch@hotmail.com or 850-212-2926. Ft. Rucker Army Ten-Mile Run-Off and 5 x Two-Mile Relay. 7:00 AM CT. Fort Rucker Physical Fitness Facility, Bldg 4605 Andrews Avenue, Fort Rucker, Alabama, 36362. 334-255-3794. End of Watch 10K/5K Honoring All Fallen Officers. 8:00 AM CT. Poplar Head Park, Dothan, Alabama. Sgt. Will Glover, wnglover@dothan.org or 334-615-3640. Taunton Family Festival 5K. 8:00 AM CT. Taunton Family Home, 200 Taunton Family Road, Wewahitchka, Florida. Online registration at active.com. Dan Walsh, 850-443-2880. Lakeside School Tech Trot 10K, 5K, and one-mile fun run. 8:00 AM CT one mile / 8:25 AM CT 10K / 8:35 AM CT 5K. The Lakeside School, 1020 Lake Drive, Eufaula, Alabama 36027. Entry form and flyer. Online registration at active.com. 334-687-5748. 7th annual Run for Wakulla Springs 5K Trail Run and one-mile fun run. 8:00 AM ET one mile / 8:30 AM ET 5K. Wakulla Springs State Park, 550 Wakulla Park Drive, Wakulla Springs, Florida 32327. 2012 story. 2011 story. 2010 story. Entry form and flyer. Online registration at RaceIt.com. Ron and Cynthia Christen, 850-926-7834 or 850-567-0500. 7th annual Missionette 5K / 10K Extraordinary Run. 8:00 am ET. Family Worship Center of Cairo, 1400 South Broad Street, Cairo, GA 39828. Event page on Facebook. USATF certified course GA09001WC (10K) and GA09002WC (5K). 2010 story. Katina Stewart 229-378-0970. 2nd annual Catfish Crawl 5K and one-mile fun run. 8:00 AM CT. 2012 story. Event web page. Entry form and flyer. Online registration at active.com. Ben Hall, firechief@blountstownfire.org or 850-674-4988. Brian Dowling Memorial 5K Trail Run. 8:00 AM CT. Westgate Park, 801 Recreation Road, Dothan, Alabama 36303. Event entry form. Larry Dykes, 334-792-6021. Road Kill 5K. 8:00am ET. Reed Bingham State Park, 542 Reed Bingham Road, Adel, Georgia 31620. 2012 story. USATF certified course GA11076WC. Entry form and flyer. Online registration at RunSignUp.com. Hearts for Military Heroes Armed Forces Day 5K. 8:00 AM CT. Frank Brown Park, 16200 Panama City Beach Parkway, Panama City Beach, Florida. Online registration at active.com. Chances For Children 5K. 8:00 AM ET. Columbia County Courthouse, Hernando Street, Lake City, Florida. Online registration at active.com. 3rd annual Fight For Air 5K. 8:00 AM ET. Southwood, Tallahassee, Florida. 2011 story. Event page on Facebook. Event web site. "Go for the Green!" Decatur County 4-H 5K and one-mile fun run. 8:00 AM ET. Spring Hill Tree Farm, 795 Woodhull Road, Bainbridge, Georgia 39819. Entry form and flyer. Ash Bailey, eabailey@uga.edu or 229-248-3033. 5th annual Valdosta Memorial Day 5K. 8:00 AM ET. Valdosta Early College Academy, 1605 Azalea Drive, Valdosta, Georgia. 2012 story. 2011 story. 2010 story. Entry form and flyer. Online registration at RunSignUpcom. A Course/Line, LLC, acourseline@earthlink.net or 229-630-1455. Gulf Winds Track Club's 16th annual Potluck Bash 4-Mile Run. 6:00 pm ET. Forestmeadows Athletic Center, 4750 North Meridian Road, Tallahassee, Florida. Event page on Facebook. 2012 story. 2011 story. 2010 story. 2009 story. David Yon, david@radeylaw.com or 850-425-6671. 7th annual Loop The Lake 5K and one-mile fun run. 8:00 AM ET 5K / 8:20 AM ET one mile. Lake Blackshear Resort and Golf Club, 2459-H US Highway 280 West, Cordele, Georgia 31015. Event web site. Event page on Facebook. Entry form and flyer. Online registration at active.com. race@loopthelake.com or 229-894-2607. Tallahassee Youth Triathlon Series Splash and Dash. 8:00am ET. Morcom Aquatic Center, Potsdamer Road, Tallahassee, Florida. Event web site. Event page on Facebook. Mike Weyant, weyantm@comcast.net or 850-241-6591. Gulf Winds Track Club / Tallahassee Parks and Recreation Summer Track Series Meet #1 (40m, 100m, 200m, 800m, two mile). 6:45 PM ET. Maclay School track, 3737 North Meridian Road, Tallahassee, Florida. Tom Perkins, 850-894-2019. 3rd annual Leon High School Volleyball Pride Stride 5K and one-mile fun run. 8:00 AM ET. Leon High School, 550 East Tennessee Street, Tallahassee, Florida 32303. Entry form and flyer. Angie Strickland, leonvolleyball@gmail.com or 850-443-1000. 3rd annual Run 4 tHe Revolution 5K and Clover Trot Fun Run. 7:30AM ET 5K / 8:30AM ET one-mile. Lake Park Elementary School, 604 W. Marion Avenue, Lake Park, Georgia 31636. 2012 story. Galen A. Mirate, gmirate@gmx.com or 229-561-0747. Gulf Winds Track Club / Tallahassee Parks and Recreation Summer Track Series Meet #2 (40m, 100m, 400m, one mile, 5000m). 6:45 PM ET. Maclay School track, 3737 North Meridian Road, Tallahassee, Florida. Tom Perkins, 850-894-2019. 35th annual Melon Run 5K. 8:15am ET. Old Jefferson County High School gym, Monticello, Florida. 2012 story. 2011 story. story. 2010 story. USATF certified course #FL06044DL. Entry form and flyer. Online registration at active.com. Jessica Corley, jessicacorley@gmail.com or 850-519-2158. Gulf Winds Track Club / Tallahassee Parks and Recreation Summer Track Series Meet #3 (40m, 100m, 200m, 800m, two mile). 6:45 PM ET. Maclay School track, 3737 North Meridian Road, Tallahassee, Florida. Tom Perkins, 850-894-2019. Gulf Winds Track Club / Tallahassee Parks and Recreation Summer Track Series Meet #4 (40m, 100m, 400m, one mile, 5000m). 6:45 PM ET. Maclay School track, 3737 North Meridian Road, Tallahassee, Florida. Tom Perkins, 850-894-2019. Wakulla County Cross Country Boosters 5K and one-mile fun run. 8:00 AM ET. Wakulla Springs State Park, 550 Wakulla Park Drive, Wakulla Springs, Florida 32327. 35th annual Hot Trot 5K. 7:30 am CT. Washington-Holmes Technical Center, 757 Hoyt Street, Chipley, Florida 32428. 2012 story. 2011 story. Course map. Stan Owens 850-547-2244. 5th annual Valdosta Independence Day 5K. 7:15 AM ET. 3200 North Ashley Street, Valdosta, Georgia 31602. 2012 story. 2011 story. 2010 story. A Course/Line, acourseline@earthlink.net or 229-630-1455. Gulf Winds Track Club / Tallahassee Parks and Recreation Summer Track Series Meet #5 (40m, 100m, 200m, 800m, two mile). 6:45 PM ET. Maclay School track, 3737 North Meridian Road, Tallahassee, Florida. Tom Perkins, 850-894-2019. 5th annual Barnes 5K. 7:30 am ET. Barnes Drug Store Downtown, 200 South Patterson Street Valdosta, Georgia 31601. 2012 story. 2011 story. 2010 story. Gulf Winds Track Club / Tallahassee Parks and Recreation Summer Track Series Meet #6 (40m, 100m, 400m, one mile, 5000m). 6:45 PM ET. Maclay School track, 3737 North Meridian Road, Tallahassee, Florida. Tom Perkins, 850-894-2019. Gulf Winds Track Club / Tallahassee Parks and Recreation Summer Track Series Meet #7 (40m, 100m, 200m, 800m, two mile). 6:45 PM ET. Maclay School track, 3737 North Meridian Road, Tallahassee, Florida. Tom Perkins, 850-894-2019. Tasty Tiger Trot 5K Trail Run. 8:00 AM CT. Westgate Park Trail, Dothan, Alabama. Mike or Carolyn Houston, 334-797-3668 or 334-797-5641. 15th annual Summer Sizzler 5K and one-mile fun run. 7:00 pm ET (1 mile), 7:30 pm ET (5K). St. George Island, Florida. 2011 story. 2010 story. 2009 story. USATF certifed course #FL99035DL. Event web site. Hobson Fulmer, hobson@fairpoint.net or 850-927-2510. Gulf Winds Track Club's 32nd annual Tallahassee Women's Distance Festival 5K. 8:00 AM ET. Optimist Park, East Indianhead Drive, Tallahassee, Florida. 2012 story. 2011 story. 2010 story. 2009 story. USATF certified course #FL00022DL. Entry form and flyer. Lisa Unger, ungertl@juno.com or 850-562-2901. 32nd annual Sickle Cell Foundation of the Big Bend 5K and one-mile fun run. 8:10am ET one mile / 8:30am ET 5K. Jake Gaither Park, 801 Tanner Drive, Tallahassee, FL 32305. 2011 story. 2010 story. USATF certified course #FL12057EBM. Event web site. jill@sicklecellfoundation.org or 850-222-2355. 6th annual Robin Lotane Memorial Red Cross Hurricane Run 5K. 8:00 am ET. Tallahassee Red Cross, 1115 Easterwood Drive, Tallahassee, Florida 32311. 2012 story. 2011 story. 2010 story. 2009 story. Bob Lotane, 850-545-9446, or Debara Jump, debara.jump@tallyredcross.org or 850-402-5612. 37th annual Rose City Run 10K and one-mile kids' run. 8:00 AM ET 10K / 9:30 am ET one mile. North Broad Street and Monroe Street, Thomasville, GA. USATF certified course GA92011WN (10K). 2012 story. 2011 story. 2010 story. Event web site. rcr@ymcathomasville.org or 229-226-9878. I only know one story about Clyattville, Georgia. A few years ago, a man in Madison, Florida told me that decades ago, when the railroad was still running between Clyattville and Madison, he and a buddy were driving around in the buddy's truck one Saturday night. About the time they decided that they might as well be back home in Madison, the two found themselves at the railroad crossing in Clyattville. Putting the truck into gear, the driver turned south onto the track and started heading toward Madison. After all it was the shortest route back to town. At the state line, the tracks crossed the Withlacoochee River. The driver advised his passenger to open the door of the truck. "So if we go over into the river, you can get out of the cab." They made it home alive so that I was able to hear the story years later. Those high-spirited lads actually outlived the railroad; the tracks were torn up long ago. 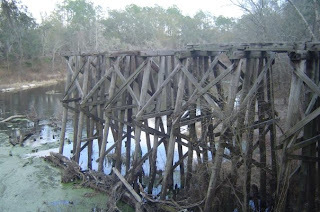 Half the trestle over the Withlacoochee has fallen into the river, and what is left standing doesn't look like it will be standing much longer. On the Florida side of the river, the old rail grade has been turned into a paved trail, running from Madison to the river. If Georgia decides to pave their portion, only a bridge over the river would be needed to allow you to walk or run or bicycle from Clyattville to Madison. In Clyattville itself you could run workouts on the trail. You could even run races on it. In the meantime, Clyattville Elementary School hosts their annual 5K Gully Run on the streets of the village. At the front of the race the second annual Gully Run on Saturday morning, 20 April 2013, repeated the results of the first. For the second year in a row, Valdosta Middle School cross-country coach Ryan Kelly outran Lowndes High distance runner Tyler Thurman for the title. This time around Kelly ran 18:00 to Thurman's 18:20. Unlike 2012, though, Thurman found himself in a fight for second place, closely challenged by Tim Komarek and Caleb Coil. Unfortunately, the three runners went off course. Maybe they were too intent on the competition. When they got back on track Komarek finished on Thurman's heels at 18:21, with Coil another few heartbeats behind at 18:23. Ten-year-old Kelsey Morse of Valdosta's Viking Runners Club took the female title, placing eighth overall in 21:23. Eryn Wilkey (9th, 21:38), another Viking Runner, was the second female finisher. Third in the division was the first female master, Valdosta's Tammy Jo Allen (13th, 22:28). 78 athletes finished the 3.1-mile race. Undeterred by forecasts of rain, the specter of the bombings at the Boston Marathon, or the rigors of 3.1-miles of running, a record crowd of athletes turned out for Gulf Winds Track Club's 39th annual Palace Saloon 5K Road Race in Tallahassee on Saturday morning, 20 April 2013. When the race was over, Stanley Linton was the latest of almost four decades of Palace Saloon 5K champions, winning a race where less than three seconds separated the first three runners. Linton's time was 15:46, his first sub 16:00 effort on the roads, although he has run faster on the track. Sheryl Rosen was the first female finisher, covering the 3.1 miles in 17:49. As the sun came up on the morning of the race, an overnight rain had ceased. Even though the skies were still cloudy hundreds of runners were arriving at Messer Park to run the Palace Saloon 5K. The crowds reflected the fact that the race had grown in recent years, grown so much that this year the start had to be moved from Dupree Street to the wider Jackson Bluff Road. Cool air and a slight breeze did nothing to stifle that growth in 2013. By 8:00 AM a record crowd of around 1,400 athletes had gathered on the starting line. Then they were loose, thundering west toward Appleyard Drive. After a run north on Appleyard, the race turned onto Municipal, about 1200 meters into the run. Florida State University NROTC midshipman Stanley Linton was first onto Municipal, with about seven other runners right behind, including the Palace Saloon 5K defending champion, Josh Meyers. Closest to Linton, though, were Tallahassee runners Will Stanford and Peter Wood. Stanford and Wood were less than three seconds behind Linton when the runners turned south onto Dupree Street, and they were no farther back at the halfway point on Jackson Bluff Road. The second half of the race was a dash east on Jackson Bluff Road to the door of the Palace Saloon. Linton continued to lead, but he couldn't get more than three seconds ahead of Wood and Stanford. Wood and Stanford continued to chase, but they couldn't draw closer than three seconds behind Linton. 800 meters from the finish, the runners crested the single hill on the course, coming into sight of the crowd waiting at the finish line. Linton was first runner they saw, then Wood and Stanford. Behind them, more athletes topped the ridge and started to race downhill toward the finish. The race remained close, but Linton remained ahead. Sprinting across Budweiser Creek, he arrived at the Palace Saloon and the finish line, securing the win with a 15:46. A breath behind, Wood won the fight with Stanford for the runner-up spot, both runners clocked in 15:49. Another 100 meters back, Jack Redwing was fourth in 16:09. 2012 Palace winner Josh Myers ended up ninth in 16:46. Top master honors went to four-time Palace Saloon 5K champion Gary Droze; the Maclay School track coach was 25th overall in 17:26. Sheryl Rosen first ran the Palace Saloon 5K in 2006; the 2013 race was her sixth. It was also the fastest Palace Saloon 5K yet for the Tallahassee lawyer. Finishing 36th overall, Rosen crossed the finish line in 17:49, good enough to take the Palace Saloon 5K women's title, Rosen's first. After being a few steps ahead at the mile mark, Rosen had gone on to build up a lead of about 80 meters on the women's runner-up, Katie Showman. Showman was 44th overall in 18:07. For the fifth year in a row, Thomasville's Mary Anne Grayson was the top woman master at the Palace Saloon 5K. Grayson was the seventh female finisher in the 2013 race, placing 84th overall in 19:47. Long after the top finishers had left the course, a river of runners continued to flow down Jackson Bluff Road to the Palace Saloon. When the last athlete was counted, 1,390 had finished, the most that had ever made the 3.1-mile trip in the 39-year history of the Palace Saloon Road Race. Some came because of the race's reputation as the fastest 5K in town. Others came in remembrance of the victims of the bombings at the Boston Marathon, just five days before. A few probably even came to have the traditional beer at the finish line. 2012 story, "Myers, Zeiler win the Battle of Jackson Bluff at Palace Saloon 5K"
2011 story, "Lake grabs his second Palace win, Zeiler her first"
2010 story, "Lake, Woytalewicz run into Palace Saloon 5K history"
2009 story, "Robida outruns a thousand to win the Palace Saloon 5K"